The fact that they make these glasses for single use, and then (at best) use energy to melt them down right is definitely not green! I wrote about this after seeing Avatar in the theatre. My solution? 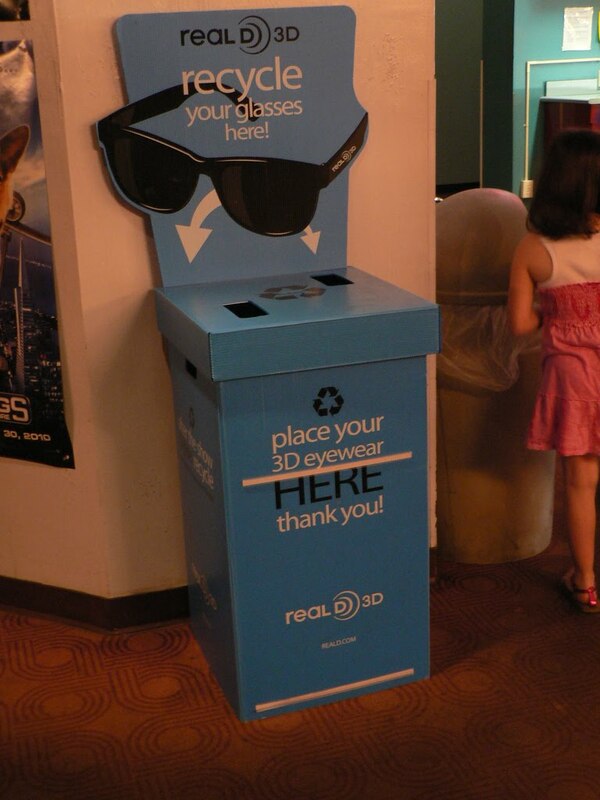 Keep your glasses, and the next time you go to a 3-D movie, bring them along. You can either tell them you don't need a new set, or, if you want to save a couple of dollars, buy a ticket for a regular (non-3D) show that starts at about the same time. We spoke to our cinema about the 3D glass being recycled, they said the glasses are actually send to a cleaning plant, they are cleaned and then used again. So they are not actually melted down and re-made into more glasses. I remember when I saw Coraline in 3D it was really annoying -- the glasses didn't fit over my other glasses (not well), it was weird and blurry without the 3D, and just plain blurry without my real glasses. I wound up HOLDING THE GLASSES in front of my face the entire movie. Yep. Ooh! They could have them attached to the chairs! That'd be easy to use. Or just have the employees use wipes. 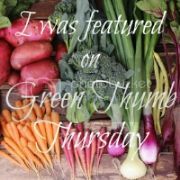 Not green, I know, but better than the energy cost of shipping, packaging, cleaning, etc. I was in a show where all of the audience had to wear masks. It meant we spent an hour every night cleaning masks. But with 6 people it's enjoyable and quick. NOT HARD. ... aaaaaand I'm all over the place. :-P Sorry, like 4 hours sleep today. OH and the other thing about 3D glasses? The number of hipster kids I've seen on the bus with RealD glasses with the lens popped out? More than my fingers can count. Hate college kids. I'd keep mine... For starters, I see movies (in a theater) once, maybe twice a year. 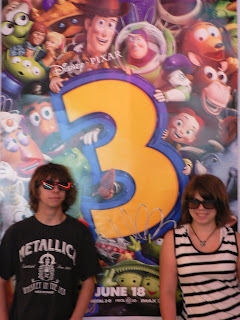 Of the last 4 movies I saw (that's 2 years worth...) 3 were in 3-d. The next movie I plan on is also in 3-d (and sadly, not out till next January). I just don't see the point in getting new glasses every time I see a movie. It's like buying a new baithing suit every time I take the cousins to the waterpark... just silly. I haven't been to one yet, tho I would love to see Alice in 3d. Keep a pair for each of your family members. 3d isn't going away I don't think. Thanks for bringing this up tho, if I ever make it to one, I'll keep my glasses for future use. The theaters should give them out free for a while then start charging - or give a discount if you bring your own even better. Maybe we need to talk to our theater managers! I disagree about the value of 3D movies. Avatar was wonderful and the 3D experience better than what I remembered when I was a kid! The technology has improved and enhanced my experience. We saved our 3D glasses and will use again if we see another one. My husband already reused ours when he took my mom to see Avatar, as well. It is my understanding that when the theater says they are recycling they are actually cleaning the glasses (like blankets and earphones on the plane). Is the whole process green? No. But I absolutely love movies and it's greener to go to a movie than to buy an actual DVD, which a lot of people still do. I'm with Pure Mothers. Sometimes 3D really ads to the movie. I saw Harry Potter in 3D and it made the fight scene in the Ministry of Magic SO MUCH COOLER. Other times 3D doesn't add so much. A friend of mine saw Alice in Wonderland in 3D and told me it didn't add very much because of the CGI they used & to save my money and see it in 2D. I spoke to my movie theater. They don't melt the glasses down to recycle them. They send them to a company that cleans and sanitizes them. That may seem like a waste too but all it takes is one person to get a rash or whatever from a pair of dirty glasses to cause problems in our litigious society. If you don't like 3D movies or even reusing glasses it's easy not to see that movie in 3D. Save your money and see it in 2D - problem solved. I hadn't been to a 3D movie in a long time so I had no idea the glasses came wrapped in plastic until after we got tickets, I was pissed. Chloe and Pure Mothers, if they are actually washing the glasses and thus reusing, rather than recycling, them, that would be a very good step. It sounds like some decent sources have confirmed that here, but I still prefer to hold on to a pair. At minimum, I avoid the plastic packaging. "WTF?! Come on people. If you want to see things in 3D, look around. Life is 3D!" Totally rad! Hurrah Hurrah! 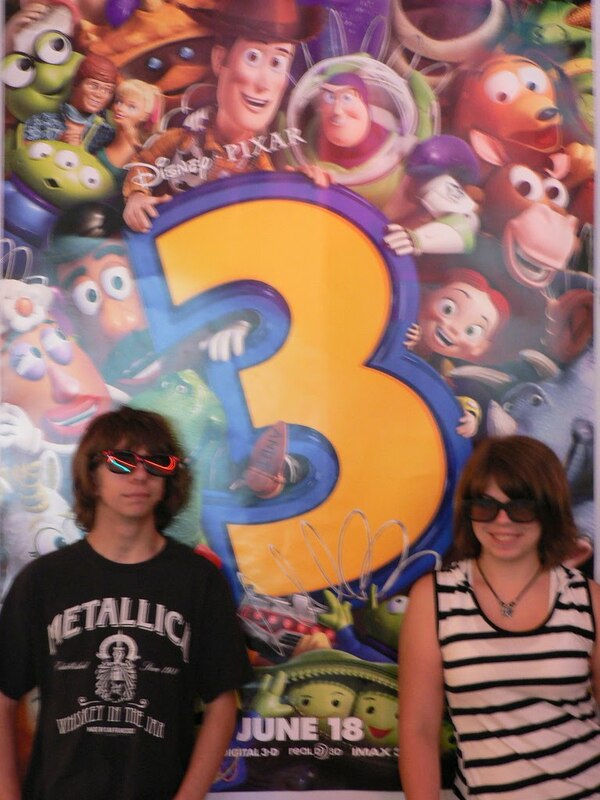 We went to Toy Story 3, not 3D. Kiddo asked why not 3D and I just said I don't feel like it. End of story, he was happy enough to see it on opening day.